Do you think you will ever have enough wood? I intend to have way too much wood left over when I stop working. 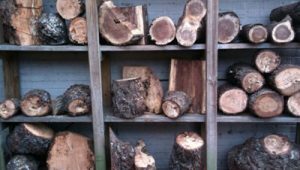 There are several sources for wood and each has its advantages and disadvantages. Right now let’s talk about wood for turning bowls. The first place you might try is Dave and Sandy’s house and get some of what is left of that cherry tree they cut down last week. They are two of my church friends and they took down a large cherry tree next to their driveway. 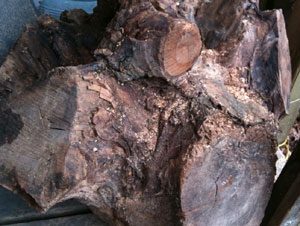 I went by with my chainsaw and chopped out some wet pieces of beautiful native cherry and lugged it home. I dropped it by the back door of the shop and put the bark side up so it could dry for a few weeks. It has some beautiful crotch wood but lots of soft sap wood and I can’t wait to get it turned out. The next step up is a raw wood dealer. I have a dealer I use on a regular basis that used to be a tree surgeon and he has a warehouse full to the ceiling with wood and wood blanks. The wood spills out into the parking lot and when you go to his place, he’s got a better chain saw than you do and you better bring your pickup truck. Last week I bought several bowl blanks from the High. 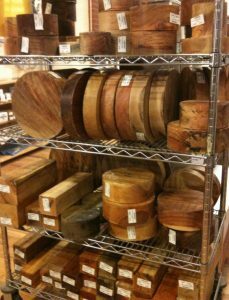 Highland sells woodturning blanks which are either eight inches or ten inches in diameter and three or four inches thick. They are coated in a waxy preservative to keep them from drying out and they are already made round, something which Dave and Sandy will not do for you. Blanks are cherry, pecan, walnut, sycamore and maple amongst others and range in price from about $15 upwards to $30 or so. They are round and flat and ready to turn, though they are green wood and will need to be dried after they are roughed out. Sometimes a flat round piece ready to turn is a real pleasure compared to a piece of a green stump and a chain saw. Unfortunately they don’t mail order the wood. You have to drop by the store and browse through the blanks in stock to find the ones you want to buy. Now the ultimate wood for turning at Highland Woodworking is outside in the enclosed space next to their parking lot, and you have to go to the store to shop for these also. If you look to the left just before you enter the store’s side door, there is a wonderful collection of huge cherry and walnut burls and crotches back in the corner. At first glance it looks like some kind of wood graveyard, but don’t let appearances fool you — there are diamonds in the rough here. 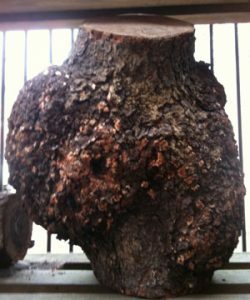 One of these days if I keep working and getting better at my craft, I will buy one of those wonderful burls. I will study it for weeks looking for that one make or break cleavage plane. 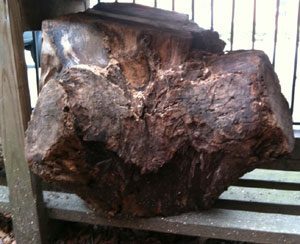 I will take a thin steel wedge and place it carefully on the burl and I will probably take it away several times before very carefully and firmly whacking it with a little mallet while holding my breath. Course I may just cut it carefully with my chain saw (while holding my breath). The result will likely be wonderful. Wood is everywhere and if you pay attention, you can have plenty of it. I looked all over for a big stump at Christmastime (wanted to paint it silver and give it to my mom as a footstool or short bench) but craigslist didn’t have any. i wish i had known about this back then!